Warning! If you have a swarm of bees that are threatening the safety of you, your family or your neighbors, don’t hesitate – call your La Habra Heights bee removal experts at Bee Busters! The dream of living in Southern California yet keeping a rural life might seem impossible until one stumbles on La Habra Heights. This unique community features one-acre lots with lots of open space and no sidewalks or lights to betray an urban feel. Since the community is entirely residential, those who live here must look elsewhere for vital services. Given the countryside air, it is no wonder that in La Habra Heights, bee removal is a necessary service. One sign of a colony on your property is bees around your home in an unusual location with no source of food (flowers) or water. This colony rarely will be exposed in a tree. It is far more likely to find the colony in a “void space” or hollow in a tree, wall, or other object. Having Bee Busters, the premier La Habra Heights bee removal company remove unwanted bees, wasps, and yellow jackets on your property can have several major benefits including the long term prevention of resettlement. Bees leave behind pheromones and the scent of honey is attractive to a range of creatures. Professional removal of the honeycombs followed by tips for sealing the area can prevent another swarm from taking up residence. Removal also prevents damage from other pests or melting wax and honey. Bee Busters, Inc. works in your community and provides residential and commercial services that are the most innovative in the country. La Habra Heights Bee Removal – We handle problem bees and stinging insects for the safety of the community. Since all wild swarms now have Africanized Honeybees, safety is a primary concern. 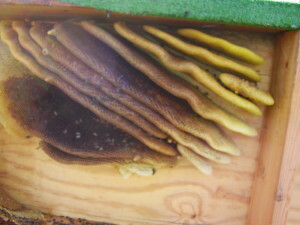 We remove both the colony or swarm and the honeycombs they have created. We also ensure the property owner has enough knowledge to prevent future bee related issues both in the location the bees were found and elsewhere. Beekeeping – We offer beekeeper services. We do on site pollination, bee keeping training and educational shows about bees. We also have fresh local honey for sale. Keeping domestic bees is a great hobby for any age. If you want more information, please give us a call. 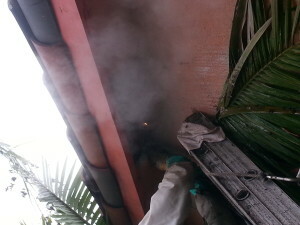 For over 25 years, Bee Busters has been the La Habra Heights bee removal service. We are highly equipped to deal with any bee situation you may have. 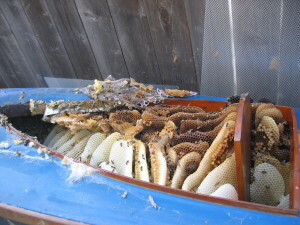 For any problem swarm or colony give us a call at 949-497-6264.